The March 2018 Boxycharm theme was Baecation and I'm thrilled that my box came at a decent time this month. For the last few months, my box has been coming extremely late...sometimes a full month late, so this was a welcome change. I've become a bit of a palette collector so it was nice to get a new one to add to my growing collection. I'm also happy to see that the Charm Room is being updated more regularly so I can finally redeem some points for something useful. 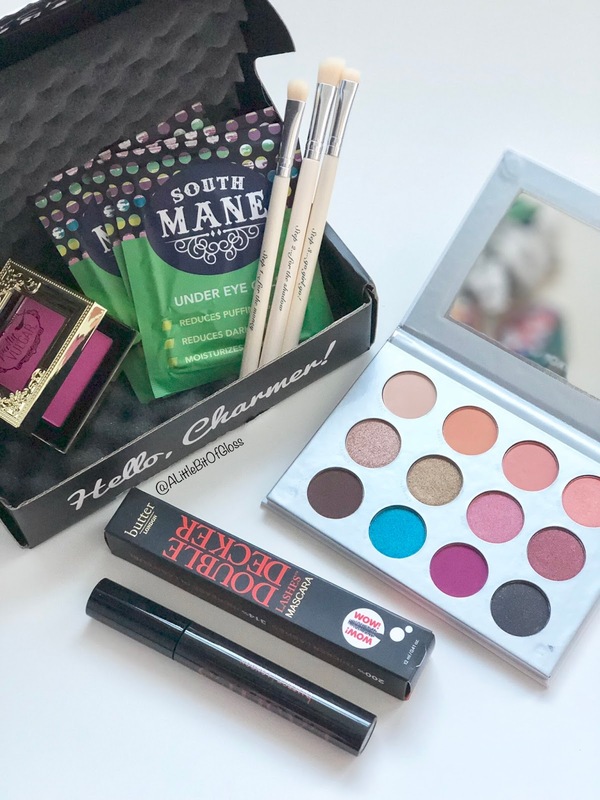 That was one reason why I preferred Ipsy over Boxycharm so it seems that Boxycharm is stepping their game up for 2018! I like that this month has a skin care item and an impressive variety of products. I rate the March Boxycharm box a 5/5. Pür eyeshadow palette- This palette is perfect for spring! I love that you can create a variety of looks with one palette like this. These pigments are silky smooth and blendable so you're able to layer shades with ease. I can see the potential for every day use as well as full glam looks. Butter London mascara- This mascara is massive! I know the picture might not do it justice but truthfully I think this is the largest mascara I've ever owned. I like that there's a ton of product in the tube but still coats my lashes nicely. This is a great daily mascara and as my first intro to Butter London, I was impressed. South Mane eye gels- I was happy to discover South Mane in my box this month because I was unfamiliar with this brand. I love using under eye gels, so this was a nice treat. South Mane offers these gels individually or in a pack of 3. I used these gels before bed and I liked that it was cool to the touch. My skin felt a slight tingle, but it wasn't anything unbearable. I only used this once so I didn't see any outstanding results that were promised like reduction in dark circles, fine lines and puffiness. It was a nice way to soothe my skin but one use wasn't enough to sing all its praises. Vintage Cosmetic Co brush set- I love doing a smokey eye look so I was very happy to get some new brushes just for that! This brush set had three brushes- a shadow brush, angles shadow brush, and a smudger brush. The set is even labelled with numbers so you know which one to use. FANTASTIC! Do you subscribe to any beauty boxes? Which ones are your faves? I'd love to hear from you! That looks like a really good box!